Companies invest a great deal to create apps. Is this the reason they try to force them on every visitor, every time they visit? 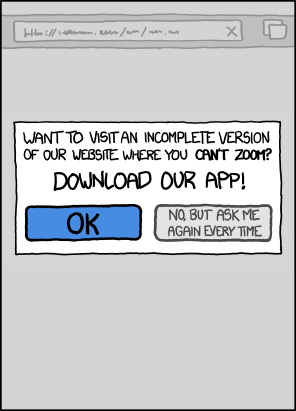 This morning, the online comic site, Xkcd, posted a strip that really hit home. You can see it here. When I'm doing my morning news scan, I click through links on a list that is automatically generated by my favorite search engine and sent to me as an alert. Quite a few of the news sources and company sites seem to have Apps for my Smartphone or Tablet and insist that I should download it even though this may have been the first (and very likely the last) time I have visited. To get my attention, they gray out the screen and force me to say no to an automatic app download time and again. Why do companies think I want their single-purpose App if it the first time I visit their website from a smartphone or a tablet? Why do they continue to require me to refuse the automatic installation of their App each and every time I visit their Website? Do you agree that the tactic of graying out the screen and forcing visitors to refuse the automatic installation of an unwanted App is irritating?